The root words for religion, re (again) and lig (connect), indicate that religions are about reconnecting with something that has been lost. But what has been lost? What is causing the separation? What are the ultimate effects of this separation? 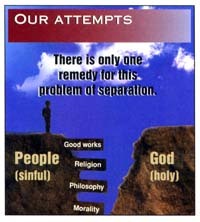 How can the separation be overcome? The answers vary and they can’t all be harmonized to all be true. your sins have hidden his face from you, so that he will not hear” (Isaiah 59:2). Islam – Allah knows all and sees all, nothing is hidden from him and a day is coming when Allah shall bring judgment to everyone. (Surah 69:18). At that time, “neither one shall avail another, nor any ransom (compensation) shall be accepted from anyone, nor intercession shall benefit anyone, nor any help will be given” (Surah2:123). Humanity’s problem is facing Allah’s judgment on the actions of their life and ensuring that the good of an individual’s life outweighs the evil, of which Allah can be the only judge. Hinduism – “Who sees the many and not the ONE, wanders on from death to death. Even by the mind this truth is to be learned: there are not many but only ONE. Who sees variety and not the unity wanders on from death to death” (Katha Upanishad Part 4).Our minds are deceived by the illusion called Maya that keeps us from all seeing the oneness of all things, and this deception on our part causes us to live within a cycle of death and rebirth. We must find the one path that leads to immortality and escape Samsara, the cycle of reincarnation, and of the paths there are many with karma dictating the position of one’s next life. Buddhism – The reality of this life is found in the mind’s perception of what is real and what is lasting. The world is always changing, always in flux, and our minds and bodies with their desires and cravings resist change. If our minds can’t acknowledge and accept this constant impermanence, pain and suffering are the natural byproduct. The origin, or cause, of this suffering is our desires for gratification and success. The Buddha taught, “The mind is fickle and flighty, it flies after fancies wherever it likes: it is difficult indeed to restrain” (The Dhammapada 35). Christian Science – Mankind’s ultimate problem is being deceived by the illusion of sin, suffering, and death. To the question, “Is there sin,” the answer provided within Mary Baker Eddy’s Health and Science is, “All reality is in God and His creation, harmonious and eternal. That which He creates is good, and He makes all that is made. Therefore the only reality of sin, sickness, or death is the awful fact that unrealities seem real to human, erring belief, until God strips off their disguise. They are not true, because they are not of God. We learn in Christian Science that all inharmony of mortal mind or body is illusion, possessing neither reality nor identity though seeming to be real and identical” (Chapter 14:472-473). Previous Post Scott Stapp – Singer of the band Creed writes Christian memoir – Sinner’s Creed.